Craftin' Caro: Happy Halloversary Blog Candy! You have to love stamping... it gives you the chance to customize any card to any occasion! I'd bet you some big bucks that even Hallmark doesn't have a "Happy Halloversary" card in their roster. Yes, today is Halloween and my wedding anniversary rolled up into one happy day. Those who know us well aren't surprised that we'd get married on such a day, but let me tell you -- we sure had a BLAST! Now we get to celebrate our special day by "trick or treat"ing with the kids and just being merry. I wouldn't change our Halloversary for anything. Here are the cards that Brent & I exchanged earlier today (you'll see he went traditional... sigh) so you can see that real men do stamp. To better celebrate my Halloversary with you all, I thought some yummy BLOG CANDY would be in order! To enter to win, simply enter a comment below sharing either a HALLOWEEN or ANNIVERSARY memory with me. Bonus points if you have a HALLOVERSARY (but I sincerely doubt it). What will the lucky winner get? Hmmmm... is it a TRICK or a TREAT? You'll have to wait and see! A random draw of all participants will be held Monday November 5th when I am back from the Hobby Show. One of my favorite memories is from 1994 (http://waldeewee.blogspot.com). The kids were from Aladdin and my hubby was the big, blue genie. He wore a "bald head" and allowed me to paint him blue! I didn't post a picture of him, but the two little ones are there. I don't have a Halloversary, but I'm close. In four days it will be our 40th anniversary. Some favorite Halloween memories are making costumes for my grandson. He would choose who he wanted to be, and I would have to try and figure out how to make the costume so it would meet with his idea of what it should look like. What fun that was. Oh my goodness... your husband did so good on his card! I love his "just went for it" mentality. Woo Hoo! Anyway, I don't have a specific favorite halloween memory, but I do just love the holiday. I love to dress out of character at least once a year!! My favorite anniversary story (sorry, it's in February) is on our first anniversary, DH surprised me by a getaway weekend. He did all of my laundry so I'd have clean clothes to take with me and scheduled with my work for me to have two days off work without me asking for it! It was great! Thanks for the chance to win! I'm not married but my boyfriend and I have been together for four years today. Does that count? I have never heard of a Halloversary but thanks for the great idea! I am guilty of procrastinating and haven't made him a card yet so when I get home from work I will have to use that. Very cool! I agree that stamping gives you lots of opportunities to make cards that Hallmark doesn't!!! Congrats! I am in for a trick or treat. My favorite Anniversary memory was when my husband sent me to have my hair done, fingernails painted and a peticure. Then we went for super and a game of pool. He invited all my friend to play. It was a blast! We have an almost Halloversary - we were married on Oct. 30th, 2004. Unfortunately, Halloween was a Sunday that year. We seriously considered a masquerade ball for our reception but our (traditional - booo!!) parents quashed that pretty quickly. My favourite anniversary memory (year 3 yesterday) was this year! We went to the zoo, zoo, zoo (how about you, you, you???) in Toronto. We had one of our first dates there and it brought back good memories! One of my most interesting Halloweens is when my husband and I went dressed as bunches of grapes--me green and him purple. I attached balloons all over. they turned out fine but we could not sit down or go thru doorways. Congratulations ! My favorite memory was when my Dad bought a case of pop corn balls and we gave them away for Halloween, we were the coolest house on the block. I can't look at a pop corn ball without thinking of him and that day. I dont have a Halloversery but I did spend our honeymoon on Friday the 13th. We eloped and ended up trying to get tickets to the American League playoffs that year and when we did not get tickets, we stayed in a hotel room as I nursed a toothache. My hubby was born on the 13 (two days after my anny) and he was 13 on that day many years ago and had his photo in the paper. The worst was our 25th when I got sick and stayed sick for 2 years but its 10 years later and I am still treating the kiddies. I was out with my kids and niece and nephews tonight. My niece is 4 and was getting tired. At one house the other kids yelled 'trick or treat' and you could hear my Niece say after 'trick or treat already!'. My SIL was mortified! Happy Halloversary to you both:) Was that an actual wedding photo or a re-inactment? Our anniversary is the last weekend in March and that is when the Auto Show comes to our town. They always have a actor come and the coolest cars imaginable. So that is our anniversary tradition, we've been doing that for several years. Afterwards we go out to a nice restaurant for dinner. Our Anniversary is close to Halloween as well (34 years!) and we actually came home early from our honeymoon so we could hand out candy for the first time! Halloween is one of my fave holidays and hubby and I still decorate the outside with lights and ghosts and music. I was really hoping to see what my 2 year old Grandaughter thought of it all but she was sound asleep by the time she got here. Happy Anniversay!!! Mine is in April. My favorite memory was when hubby bought me pearls for our 5th anniversay. He let our 1 year old son give them to me. I am not married yet, but have a long term man and we met in August. My Dad was born on Halloween and his bro and SIL married on Halloween...interesting to read all your stories. Happy Halloversary!!! Cheers to many more together! Happy Halloversary!! I got married on New Year's Eve and that always amazes people.... your wedding day is even more amazing to people I bet! Thanks for offering candy!! GREAT cards....even hubbies! Happy Anniversary! I was married in the month of August, but I do love Halloween. My favorite Halloween memories are the parties DH and I put on for my son' playgroup. Everyone dressed up (kids and parents), and parents came over a day ahead of time to help turn our garage into a haunted house. I'm not sure who had more fun...the kids or us adults! Thanks for the chance to win and sharing your celebration. Happy Halloversary - how unique! The cards are fab....both of them! My favorite anniversary memory is a weekend excursion to Charleston, SC - wonderful town - great food, horse and buggy ride, Fort Sumter, open air markets - did I mention great food?!?!? I love the card you made. His is funny! But its so impressive that he gets in there and does his thing. I love it. We have a New Yearversary! LOL It really doesn't have the same ring as Halloversary. But its so fun to do the count down to the New Year, and celebrate another year we survived together! Sorry about the screw up! Just remove my one that didn't show up correctly. My computer is acting very strange! Happy Halloversary! I was married in October too...the 19th to be exact. My one fav halloween memory has to be when I got to be a clown. My grandmother made me this fabulous clown costume with a tall pointed hat she stuffed with tissue paper. I've got a picture of it and I can remember being so proud to have a real costume and not one from the store. the pumpkin carving was always my favorite. after setting it outside with it's burning candle, we would toast the seeds and eat them. yummy! My favourite anniversary memory is the one we spent at Disney World in 2001. We decided to change our original wedding bands and got matching Mickey Mouse wedding bands for our 10th anniversary. My fave Halloween memory is when my sister and I along with our 2 friends went out at singers/dancers. I dressed as a "flapper" (from the 40's I think, and Wendy (sis) was Madonna. Can't remember what our friends were, but I know we had fun! Wish I was at that Hobby show, bet it's so much fun! Happy Halloversary to the both of you. One of my best was last year when we spent our 25th on an Alaska cruise with my sis & her husband who were celebrating their 30th anniversary. My husband and I met at a Halloween party in 1998. We bonded because we happened to be two of the only people there not wearing costumes. Someone there happened to have a camera (not unusual given the costume party thing), and our picture was taken. We married two years later in the fall, and as a wedding gift a friend tracked down that photograph which we had never seen and had forgotten it even existed. How many people are lucky enough to have a photo of the night they met their spouse framed and on their fireplace mantle?!? One of my most memorable Halloweens was when my two sons were little, 4 & 2 and we had a Halloween blizzard. I wound up pulling them in a sled as we went trick or treating in our neighborhood. I wiped a lot of candy dry and learned to buy candy I liked to hand out in case of bad weather! I sure could use a treat right about now! My kids are STILL acting like ghosts...running around...making the ghost noises with lots of squeals and shrieks!! OH my! Growing up, my mom would always make homemade soft tacos...with home make shells on Halloween. One Halloween, a few years ago, I happened to be home. So I requested this long remembered dinner so that my kids could enjoy it too. Well, those shells did not taste very well. And my mom...she said that they never tasted very well! I guess some memories really do improve with age! One of my favorite Halloween memories is a pumpkin carving party we had. All of our relatives and neighbors came. The kids and adults had a great time playing games, carving pumpkins and eating! After all the pumpkins were done we all sat on the deck steps with our pumpkins and took pictures. The kids are all grown now and it's fun to look back at the pictures. I have a Halloversary. 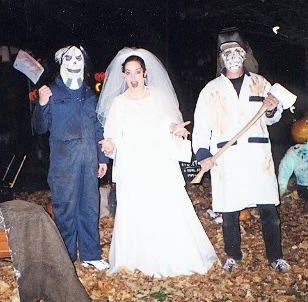 My husband and I got married in 1998 which I believe is the last time Halloween actually fell on a Saturday. I came as The Boy Wonder(Robin) and my husband was a Dallas Cowboy cheerleader(even though he is a Steelers fan). About 90 % of the men at our reception dressed up as women of some sort. It was a lot of fun. So Happy anniversary to you too. Well, Happy Anniversary! How Rockin' is that? Hubby and I have been together 21 years and we LOVE Halloween. It didn't land on a weekend to get married on back then, otherwise we would have been married BIG TIME on Halloween. My favorite Halloween memories with hubby however, are current. After 11 years, we finally had kids... now all our costumes are worked around them! My youngest (6) LOVES pirates, so every year he choses to be one... I now join in on the pirate fun. Somehow, I'm still not tired of being a pirate after 4 years! *LOL* Our oldest (8) this year and last, was Spiderman... Hubby was a (home-made, of course) Venom. Last Year he was Dr. Octo. Also 'home made' Used dryer tubing for his six extra arms! ...HILARIOUS!! !